Despite advances in medical technology, most anesthesiologists still must rely solely on their sense of touch to identify the correct insertion point for epidurals and other forms of spinal anesthesia. Even for experienced and highly skilled physicians, this poses a problem. If a patient is obese or has a spinal column that is at all unusual, a successful insertion may require multiple attempts. Two University of Virginia alumni have built a revolutionary new spine-finding device that is giving this old-school practice a much-needed upgrade. “Epidurals and spinals should be guided with medical imaging and shouldn’t be done blind,” said Will Mauldin, the co-founder of Rivanna Medical and a 2010 graduate of UVA’s School of Engineering and Applied Science. While Mauldin and fellow co-founder Kevin Owen earned their doctorates in biomedical engineering together, they began developing ways to use ultrasound imaging to find the best entry points on the spinal column and to guide anesthetic needles. 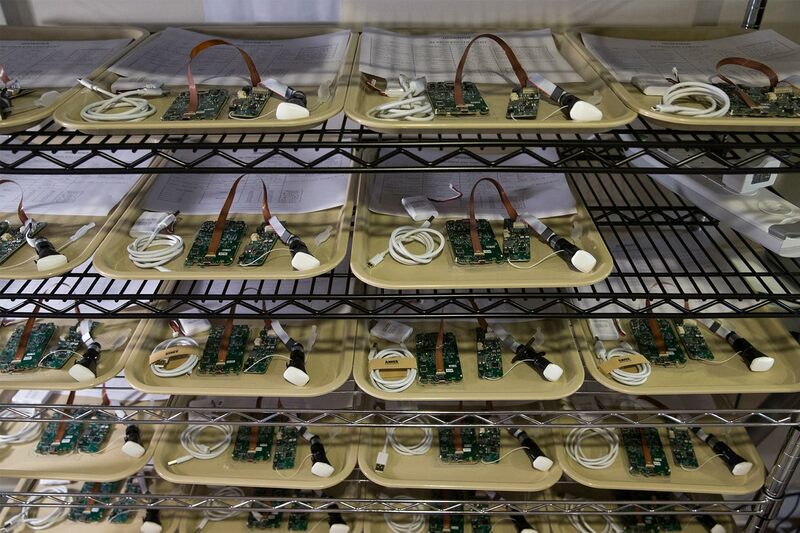 This work continued in UVA biomedical engineering Professor John Hossack’s lab, culminating in working hand-held ultrasound prototypes. With the support of the University and a grant from the Walter H. Coulter Foundation, they were eventually able to build Accuro, the world’s first ultrasound-based system that is designed specifically to aid in the application of spinal anesthesia using automated detection of the epidural location and depth. The epidural space refers to the outermost part of the spinal canal. 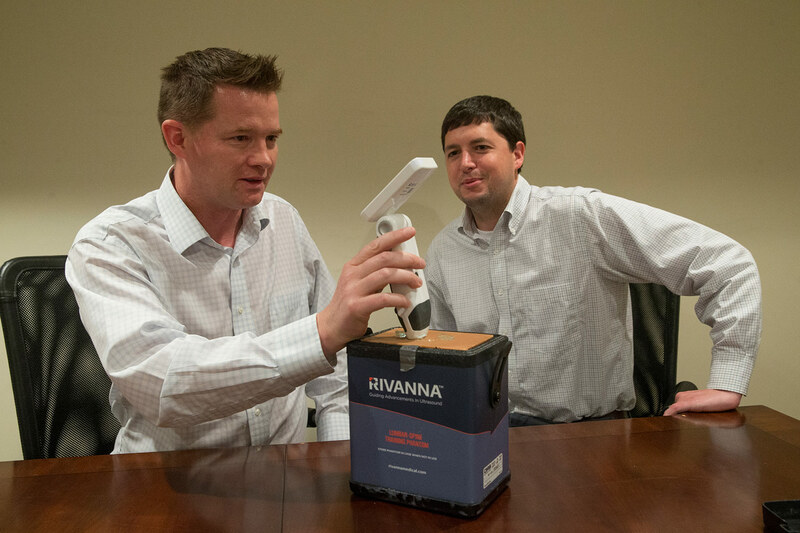 Mauldin and Owen founded Rivanna Medical in 2010 and worked with UVA’s Licensing and Ventures Group to license their newly developed technology and begin positioning their research for commercialization. They continued developing Accuro with additional support from the National Institutes of Health and the National Science Foundation and received FDA approval to begin selling it to hospitals in November. Owen and Mauldin cite published data showing that the old touch methods for epidural application vary widely between a 20 and 80 percent success rate that is heavily dependent on the patient’s anatomy and the experience of the doctor. On average, the accuracy for obese patients is much lower because their spinal column lies further beneath the skin. Accuro removes the uncertainty by providing digital overlays that identify what the user is seeing in the ultrasound image and offering a 3-D navigator that pinpoints the best place for insertion along the patient’s spine. It also includes a needle guide that will mark the skin with a bullseye or that can be used in real-time to place the needle while the device is in use, depending on the physician’s preference. To demonstrate the effectiveness of their device, Mauldin and Owen have a box with thick layer of synthetic skin on the outside and five 3-D printed vertebrae on the inside. With it, they are able to show the high level of accuracy for Accuro. “The printed vertebrae are fairly deep, so it corresponds to about a 280-pound person, a patient with a high [body mass index] of 50 or above. For that patient, doctors would not be able to feel the spinal anatomy at all,” Owen said. Their demonstrations have caught the attention of doctors around the world. Since it went on sale in November, hospitals in the United States have purchased Accuros and the international medical community is taking note. After recent sales visits to the United Kingdom, the United Arab Emirates and Saudi Arabia, European and Middle Eastern distributors have begun asking for the product. As of May, the company has announced two new distribution partnerships with Techno Orbits in Saudi Arabia and Atlas Medical in the United Arab Emirates. Rivanna Medical’s domestic customers include the UVA Medical Center and other major research hospitals around the country, including Massachusetts General and Stanford University. Despite its growing success, Rivanna Medical’s founders plan to keep their base of operations in Charlottesville and are proud to contribute to the local economy in the place that first helped nurture their idea. Mauldin and Owen hope to continue hiring to expand their sales team and ramp up production to meet the demand in new markets. In its current space downtown, Rivanna Medical has the capability to manage up to $20 million worth of product a year and anticipates further growth this year.